"Beneath the surface, everyone has a secret." 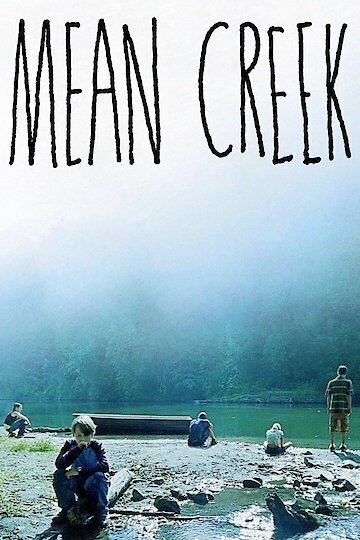 Written and Directed by Jacob Aaron Estes, Mean Creek was an American independent teen drama about a small group of high school friends and the consequences of a prank gone wrong. While at school one day, Sam (Rory Culkin) unwittingly moves a camera that bully George (Josh Peck) had set up film himself while playing ball. When George finds out, , he becomes furious and attacks Sam. Sam's older brother Rocky (Trevor Morgan) finds out, and he enlists the help of his two friends Clyde (Josh Peck) and Marty (Scott Mechlowicz) to orchestrate a prank. For Sam's birthday, they plan a boating trip where they will invite George under the pretense of friendship. Once isolated, a game of Truth or Dare would start innocently enough, until George is dared to remove his clothing and, once naked, the group would elave him out in the open, forced to walk home on foot. Sam's girlfriend Millie (Carly Schroeder), who is also invited to the party, finds out about the impending prank and begs Sam to call it off. Sam agrees and convinces Rocky, who relays the information, much to the consternation of Marty. They still hold the boat party, though, and George comes along. Throughout the trip, it becomes apparent that George is more alone and empty of human relationships than anyone had realized and is really trying to be friends. Marty, however, still determined to ridicule George, admits the reasons behind his original invitation and relishes in his obvious pain. The two boys begin to fight, and when Rocky steps in to break the boys up, George is accidentally thrown into the water. where he struggles to stay afloat. Panicking, the teens come back around, desperate to save George, but by the time they discover him, it's too late. Scared, traumatized, and unsure of what to do next, the teens must pull together in a moment of loss to do the right thing. Mean Creek is currently available to watch and stream, buy on demand at Amazon, Vudu, Google Play, iTunes, YouTube VOD online.